I’m not here today but you can find me over at Kim’s blog Reading Matters where I recommend one of my favourite finds of this year. Do go and see what other book bloggers have chosen too! It’s been a while, I know, but I’ve been to Perth and back via Hong Kong, holidaying with some of my best friends, swimming in the Indian Ocean, drinking buckets of champagne and eating like an Emperor. One of the great things about having friends all over the world is that you have an excuse to travel and you get all the inside info on where to go and what to eat. Although I’ve been rather lax in posting reviews lately, it doesn’t mean I haven’t been reading. In fact I’ve been reading some really fantastic books that I don’t know quite how to review them as I loved them so much. One of them is Xu Xi’s History’s Fiction, a collection of beautiful short stories set in Hong Kong. And of course there’s Donna Tartt’s The Goldfinch, Hilary Mantel’s Bring Up The Bodies as well as the first book in the Mortal Instruments series, The City of Bones, which I really enjoyed. 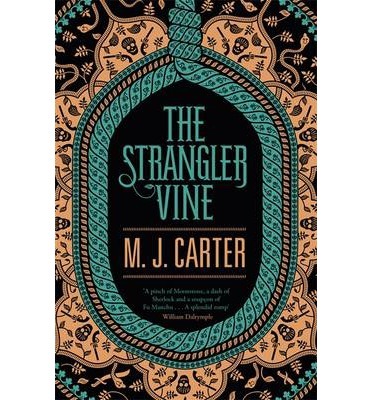 And I also received the first few chapters of The Strangler Vine by M.J. Carter which is turning out to be an interesting cross between Wilkie Collins’ The Moonstone and G.W. Dahlquist’s The Glass Books trilogy. Tell me more! So, how’ve you all been? Amazing how quick you are back here after your travels. I am still a bit in a post-Germany daze. I’ve tried a few short stories by Ferdinand Von Schirach and am impressed how he depicts people getting into committing a crime with so much love as well as humor. A number of his stories also gave me significant insight into German society, around Berlin, which is quite multi-ethnic with second generations of initial foreign workers and immigrants from East European countries. In Germany, I went to Hugendubel and saw two of Jonas Jonasson’s books that were piled up as best sellers and that interested me – whose name I’ve obvioisly never heard before. Jonasson is Swedish, never heard of him here in Japan. Yeah, I enjoyed cold and dim Germany with it’s lit-up markets and cozy homes too much that I can’t really adjust back to the mostly commercial x’mas scenes here. Happy holidays! Sounds delightful. The jet setting which I have been following on FB!!! and of course the food. One of the best parts of travel!! !